Do you need to increase your productivity? Looking for browser extensions that simplify your marketing? 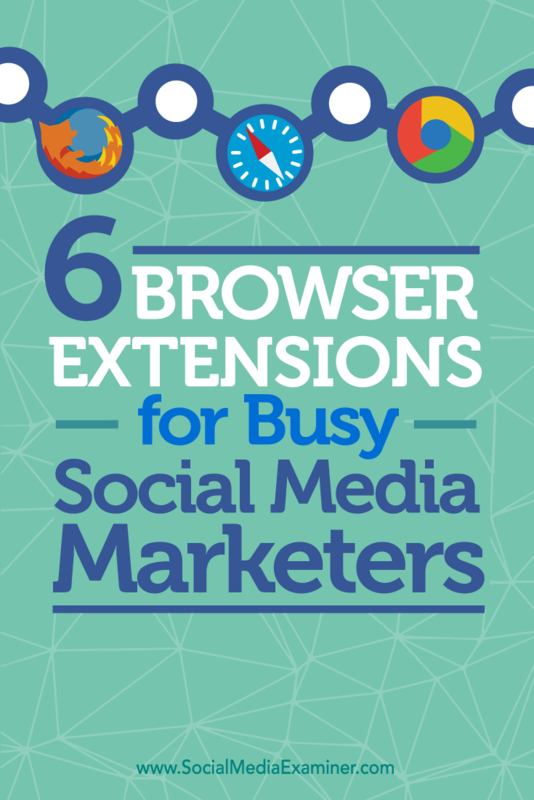 In this article, you’ll discover six browser extensions to help busy marketers. Some of the best tools are the simplest ones, and you can’t get much simpler than OneTab. When you click the toolbar icon, the tool will pull all of your browser tabs into a simple list under a single tab. You can then organize, sort, and save that tab for later. 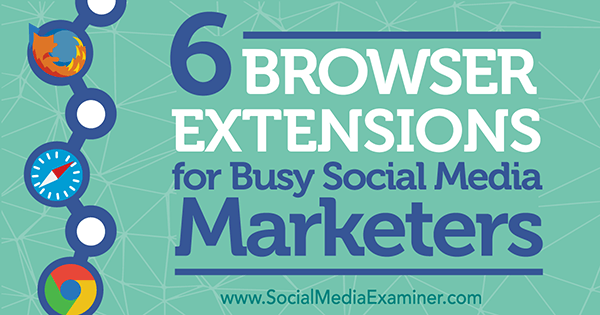 Discover six browser extensions for busy social media marketers. This free tool can be especially helpful when you’re doing article research online. It’s easy to get lost when you’re reading article after article and following link after link. With OneTab, just click the toolbar icon when you’re done and you can comb back through your tabs days or weeks later. The tool also gives you the option to save your newly formed list as a web page that others can view. Click the OneTab browser icon to pull all of your open tabs into a single list. You can then organize and save the tab for later. The Evernote Web Clipper is a fantastic free tool from the Evernote team. 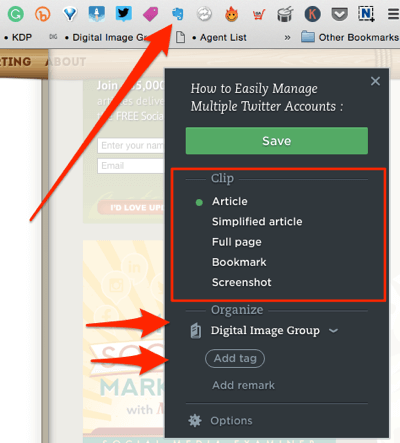 It lets you clip a web page and save it as an article, simplified article, full page, bookmark, or screenshot. After you clip it, you can add tags or comments and drop it into a folder in your Evernote account. 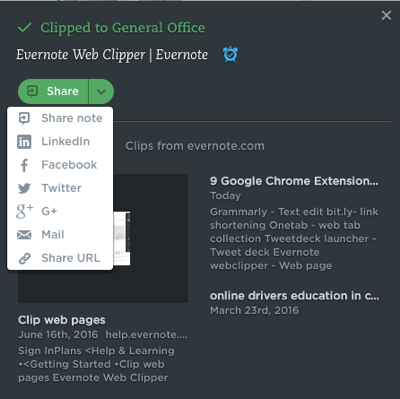 The Evernote Web Clipper gives you several ways to clip and save web pages from your browser. You can then share that article with whomever you like right from the Web Clipper dialog box. You can share your clipped web page with others from within the Web Clipper dialog box. Grammarly is a free, simple, powerful editing app that hides on your browser toolbar and edits your work as you write. As with many of these apps, there are both free and paid versions available. The free version offers a more advanced spelling, punctuation, and grammar check than Microsoft Word. You can paste your copy into the editor on the Grammarly website, upload a document, or just let the extension edit as you create social media posts in whatever program you’re using. The app runs in the background, and if your copy is clean, you’ll see a green icon. If your copy needs work, you’ll see a red icon along with suggestions. Grammarly will analyze your text and display a little green “G” icon when your copy is nice and clean. If you opt for the paid version, you get more robust features like style and sentence structure suggestions, vocabulary enhancement tips, and a plagiarism detector. You also have the option to submit your work to one of their professional proofreaders. If your copy needs work, Grammarly highlights the problem copy and offers suggested changes for improving it. Hootsuite is a powerful social media management tool, and their Hootlet extension offers an easy way to create and schedule social media posts from within your browser. 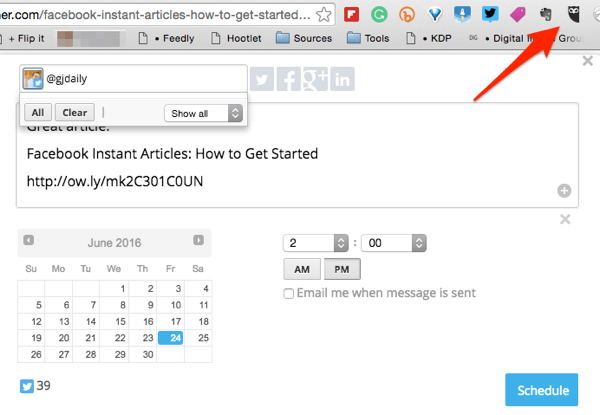 Cruise to a website article that you want to share and click the Hootlet icon to make the magic happen. You can then choose which social media account you want to post it to, edit the post, and post it now or schedule it for later. Clicking the Hootlet icon offers scheduling and publishing options without having to leave your workflow to open Hootsuite. RiteTag is a great tool for researching relevant and trending hashtags. To access the free version, you need to use RiteTag’s website. 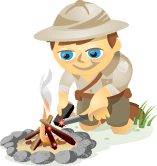 Just enter your keyword or topic in the search box. Searching hashtags on RiteTag offers insights into what tags are trending and what tags to avoid. You can get access to the browser extension at the paid level (starting at $11 per month). 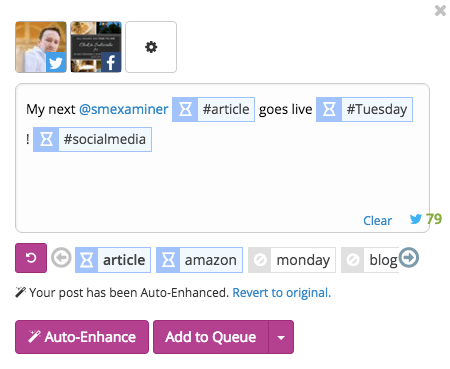 This allows you to enhance your social media posts with hashtags related to the topic you’re writing about. RiteTag offers a free seven-day free trial to test its powerful extension features. 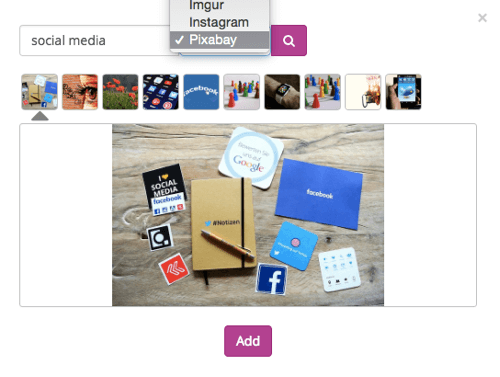 RiteTag’s extension lets you upload images to your post, add emojis, edit calls to action in your links, and see your saved tag sets. You can even search for free images or GIFs to add to your posts. Quickly adding free images to your posts can help you increase engagement on your social media channels. RocketBolt works a little differently from other extensions. The extension itself doesn’t do anything when you click it; but you need to have it installed to unlock its functionality. When used in conjunction with Gmail, RocketBolt lets you track individual email open and click-through rates. Marketers are used to this in programs like MailChimp and Emma, but those programs don’t give you that information on the individual level. Why does this matter? Because you can see if a specific person is reading your email. RocketBolt lets you see who has opened your email and where they opened it from within the app’s dashboard. At the paid level, you can track what individuals are saying on social media, and if and when they visit your website, providing unique feedback on how different campaigns are working. These extensions are powerful tools on their own; however, a pro trick is to install them and start using them together. For example, collect your tabs in OneTab and pull them into a single page with annotations with Evernote Web Clipper. What do you think? Do you use any of these web browser extensions? What are some tips that you’ve found with these tools? Let us know in the comments below. Tips on six browser extensions to help busy marketers. Having managed social media marketing for agencies and universities, Greg Joseph Daily now owns the Digital Image Group marketing agency. Connect with him online today at DigitalImageGroup.org.